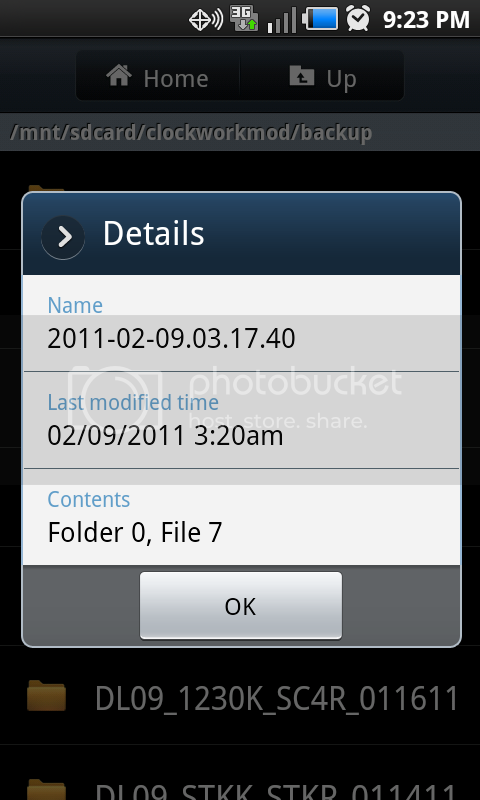 A ROM backup made today indicates tomorrows date. Looks like CWM uses GMT or maybe GMT-1 instead of the system time to stamp the backup file name. Just FYI if your looking for backups you swear you made on a certain date and time. Both Mac and Phone time settings are accurate. Tried to search prior to posting in case this has been covered already. thats wierd. mine show with the right time. Very interesting... Here is a screen grab from the phone, so it's not a MAC issue. Running new CWM Green, i think your running Red if i recall correctly. Maybe that's the difference. that very well could be. you need to be on the new red. stupid crap is gonna happen to your phone. you may not notice everyting all at once. just flashing new red wont fix anything by itself. you will have to reflash to fix stuff. Did another backup (initiated from Red recovery and not ROM manager) and the date is still tomorrow. Just weird! Well at least I have new Red on board. Edit: Just read your post again: "you will have to reflash to fix stuff." I guess I will tinker with that tomorrow. Cleared data, cache, dalvik. Flashed SC 1.0 again using new Red CWM. Set up the phone from scratch again. 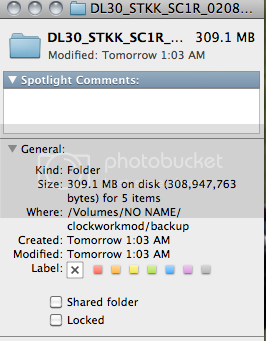 Performed a backup and still shows tomorrows date. Phone is running good with no issues so far, so I guess I wont worry yet. That's strange. Ill reflash cause I'm bored so the time being off would be just an excuse for me. Yeah, I flash just for the fun of it sometimes, so not a big deal. I have noticed today that my battery life has significantly improved. Same time yesterday with DL30/SC1.0 I was already at 50%. Today I'm at 90%! WOOHOO! Could be anything, but the install of Red then the clear and re-flash of SC1.0 did not hurt it one bit. Back to the original topic, looks like file name dates may use UTC time, which is not an issue. i just did a nandroid and mine used the right time. so i redownloaded the new cwm and reflash and same thing, the time is correct.